*Preheat the oven to 210°C, gas mark 6. Place the parchment sheet on the oven tray. 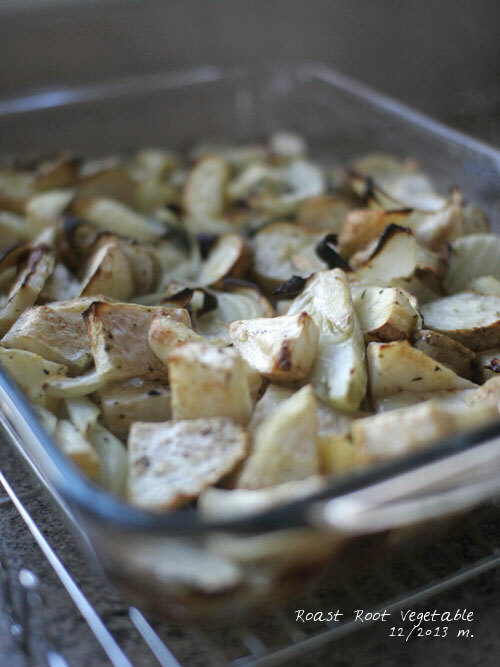 Place all vegetables, herb and seasoning in the oven proof tray. Mix them with the hands. Roast them preheated oven for about 25~30 minutes or until they are cooked and coloured with slightly brown. Serve immediately or leave in a room temperature. Most of British root vegetables expect onions, potatoes, carrots are not familiar for Japanese. 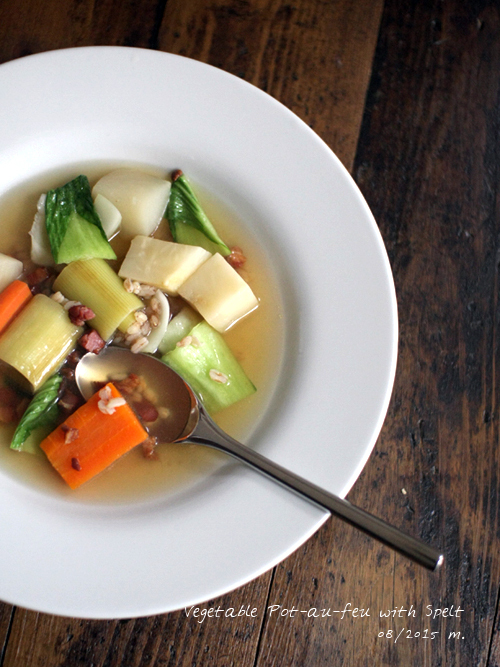 But basically we love root vegetables and we tend to cook for versatile soup. So… !! simply I put them together. Obviously this recipe is healthy and low calories. Don’t forget sprinkle with spring onion and dried bonito shavings. I think the relish is necessary for the dish. 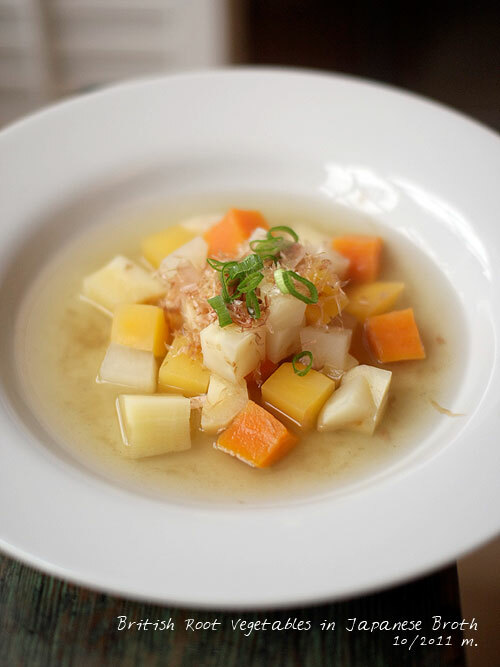 Boil the soup stock over a high heat in a pan and simmer to a low heat then add the sake, salt, soy sauce and mirin. Cook the celeriac for about 10 minutes and add the turnips, swede, parsnips and cook for 5 minutes. Remove any scum with a ladle and cook the sweet potato for about 5 minutes or until soften. Serve the vegetables and soup and sprinkle with spring onion and dried bonito shavings. 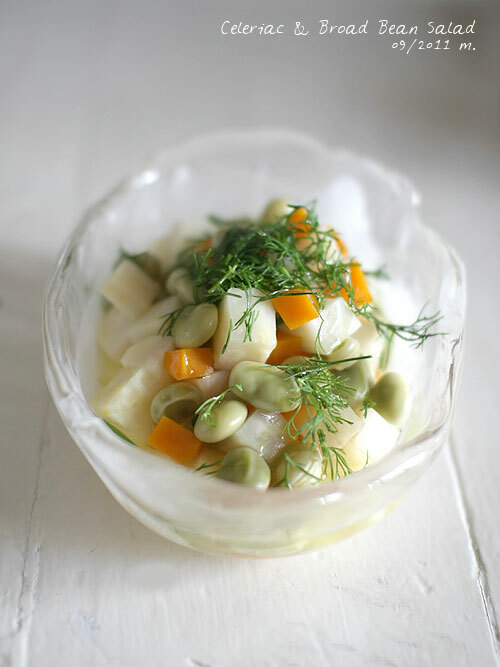 Place the celeriac, beans, carrot, orange juice, lemon juice, 400ml water and salt over a high heat. Bring to a boil. Simmer for about 30 minutes or until they are tender. Turn off the heat and leave it cool. Divide into the serving bowl. Drizzle with olive oil, sprinkle with fennel and serve hot or cold.